“You’re an idiot, why should you be a collector? 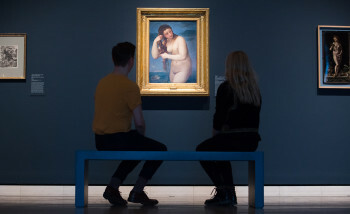 If you like beautiful things go to the Louvre instead of indulging your feelings for ownership” said a young Matisse. Soon after, however, his attitudes changed. Throughout his life, the artist amassed pottery, masks, crockery, textiles and miscellany – old friends which followed him from studio to studio to be depicted in a lifetime of drawings, paintings and cut-outs. Neither strategic nor prestigious, Matisse’s collection was dictated by whatever caught his eye in flea markets, junk shops and on his travels abroad. “There are always flowers for those who want to see them”, wrote Matisse in his 1947 publication, Jazz, and certainly there were plenty in his studio, displayed in a variety of vases, jugs and old bottles. Though Matisse often depicted flower arrangements literally, he also played with their forms until they were abstracted into something else entirely – such as in his 1949 Mimosa cut-out, thought to have derived from the mimosa flower, which plays a bright yellow part in Nice’s annual Festival of Flowers. When he became bed-bound by near-fatal surgery, Matisse directed his assistants to pin his cut-outs to the studio walls and wrote that they were cultivating “a little garden all around me where I can walk”. Henri Matisse, Red Interior: Still Life on a Blue Table, 1947. Oil on canvas. 116 x 89 cm. Kunstsammlung Nordrhein-Westfalen, Düsseldorf. Photo © bpk / Kunstsammlung Nordrhein-Westfalen, Düsseldorf / Walter Klein. Artwork: © Succession H. Matisse/DACS 2017. Kuba cloths are made of raffia, woven into complex geometric patterns and produced in Central Africa’s Kuba kingdom, a pre-colonial kingdom in the south-east of today’s Democratic Republic of the Congo. Families would pass their best cloths down through generations, each an independent, prestigious item, sometimes worn as festive attire at funerals. They believed that these cloths were the key to being recognised by clan ancestors in the land of the dead. When Europeans arrived in the Kuba kingdom in the late 19th century, various objects were shipped back to the colonising countries, detached from their origin and context. A large number ended up in Parisian flea markets – the artist’s favourite haunt for purchasing new collectibles (spot his leopard rug under the desk, too). Matisse admired these objects more for their formal properties than their cultural significance, describing the Kuba cloths as his “African velvets” which he appreciated for “the mystery of their instinctive geometry”. He wrote that he often sat staring at them for long periods of time, “waiting for something to come to me”. These patterns may have been what inspired the zig-zags of Red Interior: Still Life with Blue Table (above) – expanding and distorting the space on the canvas. Pastel on paper. / Private Collection / Peter Willi / Bridgeman Images. © Succession Picasso/DACS, London 2017. Matisse took great pleasure in wandering through market stalls, picking up small flocks of birds from merchants and bringing them back to his studio. He kept various cages of doves and songbirds at any one time, allowing them to fly freely around the house. Despite this, his studio was also shared with several cats – Minouche, Coussi and La Puce (“the flea”) – who the artist fed brioche for breakfast every morning. When Matisse’s health began to deteriorate, he gave his last four doves to Picasso, saying that “I ought to give these to you because they look like some you’ve already painted”. Picasso did indeed use the gifts as models; one bird went on to have “a very distinguished artistic and political career,” as the artist Gilot remarked. It was depicted in a simple line sketch and used as a poster illustration for the Communist-sponsored 1949 Paris World Peace Congress – soon becoming a stylised symbol of peace and the ideals of world communism. 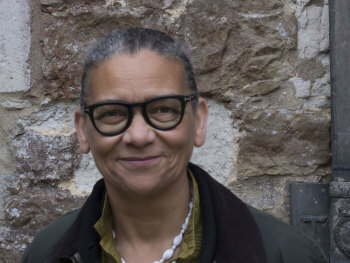 A fitting legacy for a bird that spent much of its life among “defiantly escapist art” (as described by Matisse scholar Nicholas Watkins), in a studio shut off from the turbulent events beyond its walls. This pewter jug made its debut in Matisse’s artwork in 1917, but then disappeared from his canvases for two decades. 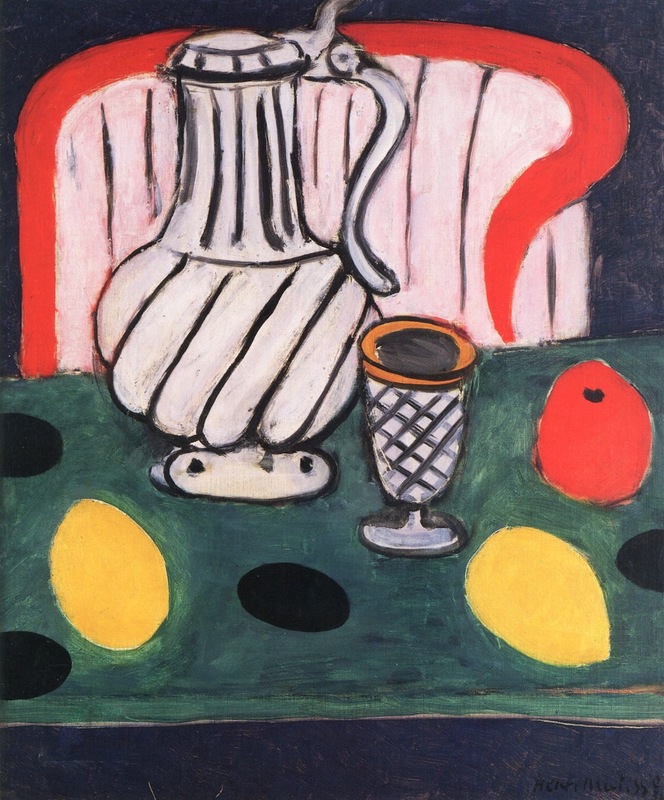 In 1937, the full-bellied jug returned in numerous works including Yellow Odalisque (above), Purple Robe and Anemones (1937), Tin Pitcher, Lemon and Armchair (1939), and Still Life with Magnolia (1941). The jug also appears among the arrangement of objects in the photo above, which was taken by Hélène Adant as part of a series of photographs for a book called Henri Matisse: Un Roman, written by the surrealist poet Louis Aragon. 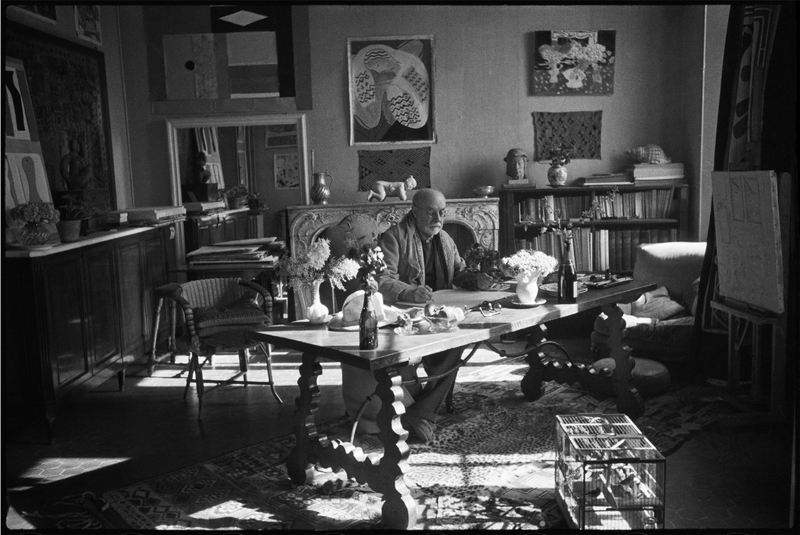 Memorialising his hoard (spot the blue table painted in his Yellow Odalisque work too), on the back of the photograph Matisse wrote “objects which have been of use to me nearly my whole life”. Though Matisse certainly took a fancy to Central and West African objects, he collected objects from other cultures too – especially the Islamic world. This sculpture of a head, however, is thought to be from medieval France, possibly depicting one of Jesus’s 12 apostles, James. Matisse took great interest in portraiture, believing that among the lines of the face he could discover “the deep gravity that persists in every human being”. For this pursuit, African masks were hugely inspirational. He acquired his first African object in 1906 and in just two years he had collected more than 20 masks and sculptures from the continent. The fascination continued for decades; it’s thought he acquired the helmet mask above in 1937. Originating from the Kuba kingdom (like the patterned cloths) and carved from a single piece of wood, the mask became part of Matisse’s lifelong exploration of facial representations outside of the European artistic tradition. The bulbous forehead and bold, deep-set eyes of his sculpture Head of Jeannette V (above) was certainly aligned with the principles of African art than a traditional Western approach to portraiture. In 1945, fellow painter Charles Camoin gave Matisse a passage that he’d copied from a text by the poet Paul Valery: “Perhaps what we call perfection in art is no more than the sense of wanting or finding in human work that certainty of execution, that inner necessity, that indissoluble, reciprocal union between design and matter, which I find in the humblest seashell”. Admittedly, Matisse’s shells were rather less humble than those you’d find in Nice – many were large, opulent, iridescent, spiralled or spiked. One such shell was brought back from the artist’s visit to Tahiti in 1930. It was simplistically drawn on brown paper in an early cut-out from 1940, which was then used as a model for a painting, where the shell is coloured a fleshy pink (above). Matisse’s interest in the natural geometry of shells is most explicit in one of his best-known cut-outs, The Snail, which he produced the year before he died.